Gareth Edwards’ Godzilla is nothing short of a miracle: A monster movie that is both a genuinely thoughtful, consistently engaging human-scale drama, and a gleefully destructive, viscerally satisfying exercise in daikaiju mayhem, each side of the film stemming organically from the other. It is a complete package, the rare summer blockbuster that features characters, ideas, and a story worth investing in, and is truly, powerfully awe-inspiring on top of that, a blisteringly realized exercise in tension, atmosphere, and scale. The film is a major statement of artistic voice and ability from Edwards – here directing his first Hollywood production – a film smart and rich enough to attract a wide, diverse audience, but which does not feel studio manufactured or mandated even in the slightest. Equally likely to please longtime fans of the character as it is to enrapture the uninitiated, Edwards’ Godzilla is an absolute triumph, and throws down the gauntlet for every summer spectacle yet to come this year. What astounds me most about this film is that, although it clearly takes tonal and structural inspiration from Ishiro Honda’s original 1954 Godzilla - which I recently discussed at length here – it is absolutely its own movie, and knowing how Godzilla was originally introduced and depicted won’t do a thing to cue viewers in to how this film’s narrative unfolds. 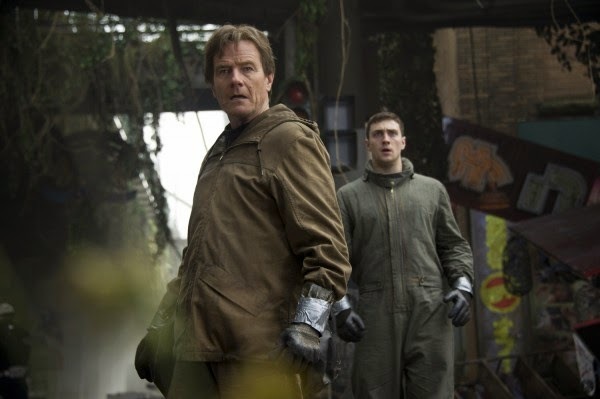 The movie starts fifteen years in the past, introducing us to Joe Brody (Bryan Cranston), a nuclear physicist working in Japan, and his family on the day of a major nuclear disaster. It is a tense and instantly gripping opening, one that expertly establishes the compelling mix of scale and intimacy that defines much of the film. There are immediate stakes at work here, for the Brody family and the world at large, and the film sets its hooks in deep with a truly engaging sense of mystery surrounding the opening actions. That aura of intrigue is crucial, for when the action picks up in the present day – now following Joe’s son Ford (Aaron Taylor-Johnson) as he tries to help his father deal with the scars of the past – the film is driven by the characters’ quest to piece things together. The original Godzilla has a similar structure, focusing on the mysterious origin of the monster before giving him a substantial appearance, and like that film, Edwards’ Godzilla initially builds its tension quietly, establishing the characters and pseudo-science behind the story before kicking things into a higher gear. It’s an extremely effective structure, doubly so for those who may think they know what the story is building towards, only to discover that Edwards and writer Max Borenstein have plenty of tricks up their sleeves. The film almost aggressively subverts expectations – for as much as Edwards has talked publically about paying homage to the original film, this Godzilla also honors the subsequent cinematic legacy of the character in the most exciting of ways – and it makes for some of the most exhilarating and captivating exposition I’ve seen in years. In any case, the brilliance of the film’s pace is that it moves audiences to the edge of their seats well before a monster ever shows its face, and even once the reveals come, Edwards is remarkably disciplined in keeping Godzilla and the other creatures at an arm’s length. 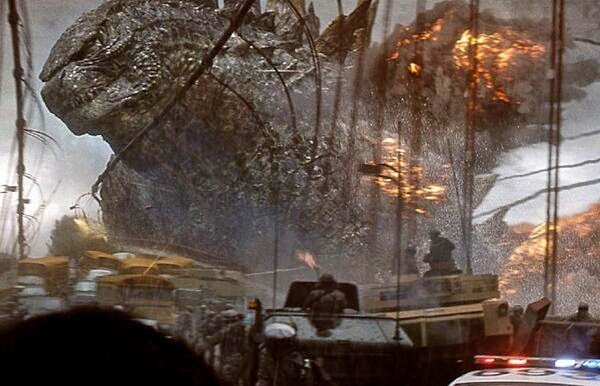 The film is a beautifully realized exercise in delayed gratification, only showing us glimpses of Godzilla’s might and fury until the final act, at which point our investment is at its peak. The pay-off could not be more spectacular or passionately realized – Edwards’ love for Godzilla is evident in every last frame the creature inhabits, and there are some moments of pure and unfettered cinematic glee in the climax that rival both The Avengers and Pacific Rim for fully, joyfully embracing the possibilities of the characters and scenario – but the finale lands as hard as it does because Edwards puts in the legwork beforehand, letting the story breath, giving the human characters weight, and only putting Godzilla on screen when he absolutely matters. 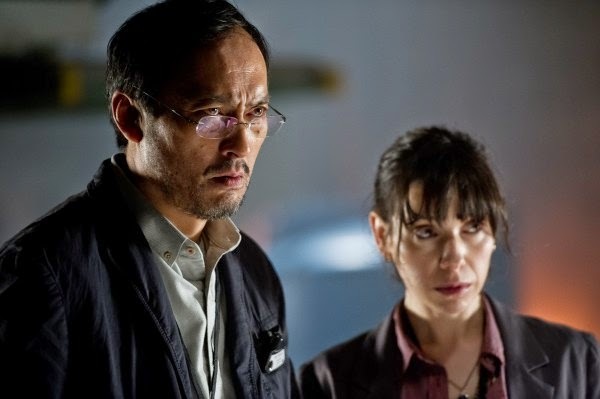 In short, the human dimension is just as important here as the scale of destruction, and it speaks volumes that I felt invested in Godzilla as a narrative first, and a monster movie second, something that can so rarely be said of films in this genre (it’s the balance Michael Bay’s Transformers films inexplicably aspire to, but always fail at miserably, for instance). This film isn’t thought provoking in the way Honda’s original Godzilla was – that movie was a direct reaction to Japan’s national trauma of nuclear devastation, a thematic immediacy that cannot be tapped into in the same way today – but it is deeply thoughtful, and as an allegory for the futility of mankind’s insistence on attempting to control nature, Edwards’ Godzilla is intellectually potent and emotionally resonant. Its characters are broad and archetypal, but expertly sketched and performed to help us see the action from their level, to insert ourselves into the crisis and feel a human connection to the mayhem. No demolished building or ruined city lacks weight here, because we are with the people at the heart of things from the beginning, and we care enough about them and their individual perspectives to understand what the action means to those experiencing it. In principal, this sounds incredibly basic, like screenwriting 101, but only when one sees a film pull such basics off so completely does the significance of the effect truly come across. And here, Godzilla gets to have its cake and eat it too – be serious and thoughtful and character-driven, but also incredibly fun and satisfying as a cinematic spectacle – precisely because it works from the foundations up, richly developed in part as in whole. It certainly helps that Edwards has filled every role, no matter how large or small, with extremely talented actors capable of commanding the screen. Bryan Cranston, Juliette Binoche, Elizabeth Olsen, and Sally Hawkins may all have relatively small parts here, but their presence makes a difference – Cranston’s especially, as he firmly establishes an air of palpable emotional realism early on – while leads Aaron Taylor-Johnson and Ken Watanabe do a great deal to give the film weight and purpose. Watanabe’s character is, functionally, a cipher for exposition, but the man is so good at playing a particular mixture of surprise and despair that he both grounds and elevates many of the major narrative turning points. Taylor-Johnson is technically playing the protagonist here, the character at the heart of almost every scene, and what impresses me most about his work is how he doesn’t play Ford Brody as a hero, but as a regular guy thrust into an impossible situation, doing his best to live up to the many responsibilities that present themselves. 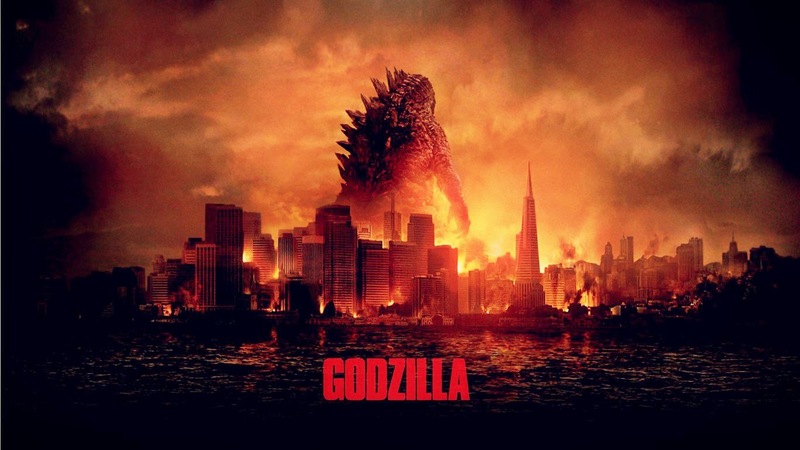 On a basic level, the character is an archetype – the displaced man trying to get home to his family – but there is a lot of interesting nuance in the writing, including the parallels the film draws between Ford and Godzilla, and Taylor-Johnson revels in those subtleties. Yet as good as the cast is, the real star here is Edwards himself, because few feats of direction are this artistically rich and assured, especially from someone helming their first Hollywood blockbuster. There are individual images here that will linger with me for a long while – cinematographer Seamus McGarvey shot the hell out of this movie, and it is visually breathtaking from beginning to end – and in addition to creating an immersive atmosphere of palpable tension and distress, Edwards’ evocation of perspective is positively inspired. Edwards frames the majority of the action from a human level, and while that often results in visual incoherence (again, see Transformers), he has managed to do so in a way that powerfully conveys the sense of scale at work, and which creates an omnipresent sense of true, visceral awe as a result. Godzilla’s introduction into the film, in particular, is absolutely genius in how it doles his appearance out to us piece by piece, in tandem with the movements and limitations of the human eye line, and later sequences – including a heartstopping set piece on the Golden Gate Bridge – make brilliant use of fluid camera movements to put us right in the middle of the action, as if we have been transported out of the theatre into the world of the film. And just as Ishiro Honda used the unique properties of black-and-white photography to emphasize and heighten Godzilla’s terror, Edwards uses color – particularly reds and browns, in the final act – to elevate the visual power of Godzilla’s might and destruction. The only area where the film comes up short at all is Alexandre Desplat’s largely bland and generic musical score. Desplat is a great composer, but the material here is a stretch for his talents. Rather than doing what he did on the final two Harry Potter films and writing soft, subtly haunting themes to counterpoint the action and underline the story’s emotions, he has chosen to try matching Edwards’ visuals in intensity and scope, and it mostly falls flat. Desplat’s Godzilla theme is such a poor, dry substitution for Akira Ifukube’s original Godzilla motif that one wonders if Edwards simply couldn’t secure the musical rights from Toho, and while Desplat delivers a couple of nice, quieter cues here and there, the overall effect is a hindrance to the film. But what a minor quibble that is against the totality of the film’s achievements. This Godzilla is more than a mere rebirth of a pop-culture icon (something that would, on its own, be a major accomplishment, given that the character has never been creatively viable outside Japan before – see the deplorable 1998 Roland Emmerich film for proof). It is a masterful piece of filmmaking in its own right, the rare summer blockbuster that delivers a great film and a terrific spectacle all in one cohesive package. That it gives the King of the Monsters a bright, bold new day in the sun is almost secondary. Few contemporary films – blockbuster or no, summer or awards season – have this much to offer.